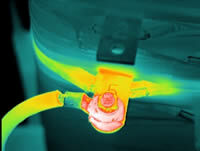 During the past few years, one of the largest growth areas in thermography has been in the area of Building Sciences. Despite present myths, infrared inspections of buildings are not ‘simply point and shoot’. In fact, infrared inspections of building envelopes and associated systems remain some of the most complex types of infrared inspections. Accurate interpretation of data depend upon proper selection of an infrared imager, a thorough understanding of the systems inspected, interaction of these systems with their surroundings, and the thermal patterns associated with defects. This short course will focus on common applications and key considerations for performing accurate infrared inspections of buildings and their subsystems. This material is intended for anyone wishing to understand the application, uses, and benefits of infrared thermography as a building diagnostics tool. Course is designed for in-house and contract thermographers, home and building inspectors, construction personnel, and mold investigators.